Our clients range from twenty five bed rural hospitals to two-thousand bed world renowned teaching hospitals and every size in between. 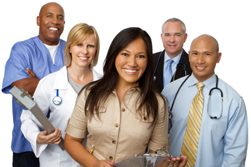 Our clinical staff is as diverse in experience as they are diverse in ethnicity. They include every level from the seasoned staff with years of experience and proven track records to the fresh, more recent graduate working for RNI where they completed their clinicals. Our clinical staff is culturally diverse mirroring the diversity of the patients they care for. Our administrative staff is also culturally diverse coming from all over the country and all over the world – France, Fiji, Panama and The Philippines. Their average length of employment is greater than 15 years.